例(原著論文)：Kawahara, M, Sako, H, and Sato, H (1998) Experimental study of Seita-fitting. J. 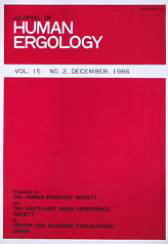 Human Ergol., 27:47-54. Heerwagen, JH and Orians, FH (1993)　Humans, habitats, and aesthetics. In: The Biophilia Hypothesis, ed. by Kellert, SR and Wilson, EO, Island Press, Washington, DC: pp. 138-172.